Unleash the fantasy artist in you with this complete step-by-step guide. The Art of Drawing Dragons features the work of accomplished illustrator Michael Dobrzycki, who shares his talent for drawing dozens of fantastic creatures from folklore, legend, and myth in both graphite pencil and ink. In no time, you are sure to be drawing creatures from eastern dragons to hairy trolls. This all-in-one reference book from Walter Foster’s Collector’s series wastes no time getting readers involved. From the beginning, it delves into essential information about drawing tools and techniques. An assortment of detailed lessons follows, featuring dragons and other mythological creatures from around the world, including those originating in Egyptian, Irish, Norse, and Greek mythology — whereas most other fantasy books include generic, non-regional subjects. The ever-increasing popularity of mythological and fantasy creatures in film, graphic novels, and television creates high demand for instruction books on drawing these fantastic beasts. In this newest addition to the Collector’s series, aspiring artists learn by utilizing the clear, step-by-step instructions for drawing everything from fire-breathing dragons to seven-headed monsters and magical fairies. Information on the origin and history of mythological creatures gives this book an extra-special appeal. The author’s helpful tips on shading and drawing techniques show readers everything they need to know to create their own impressive beasts. 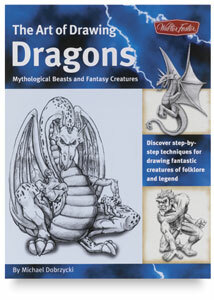 Although there are many fantasy-themed drawing books available, this book is unique because it features a wide range of fantasy subjects rather than focusing on only one type of creature such as dragons or fairies. It also distinguishes itself from similar books with helpful information on combining graphite pencil with other media, such as charcoal and black watercolor paint or ink. Michael Dobrzycki is an accomplished painter, carpenter, puppetmaker, and sketch artist whose work has been featured in more than a dozen children’s books and small press publications. In 2001, Michael was inducted into the Disneyland Entertainment Hall of Fame. He received a master’s degree in illustration from California State University, Fullerton, and holds bachelor’s degrees in both art and history from Whittier College. He is currently a visiting professor at Whittier College and lives in Whittier, California. Paperback. 144 pages. 9" x 12" (23 cm x 31 cm).